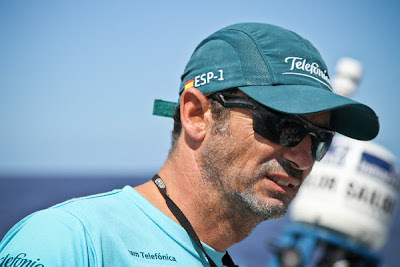 A marathon match race for second place has kept Telefónica (Iker Martínez/ESP) and CAMPER with Emirates Team New Zealand (Chris Nicholson/AUS) fully occupied, while PUMA extends her lead to 25 nautical miles (nm) in the race to the Equator and beyond. 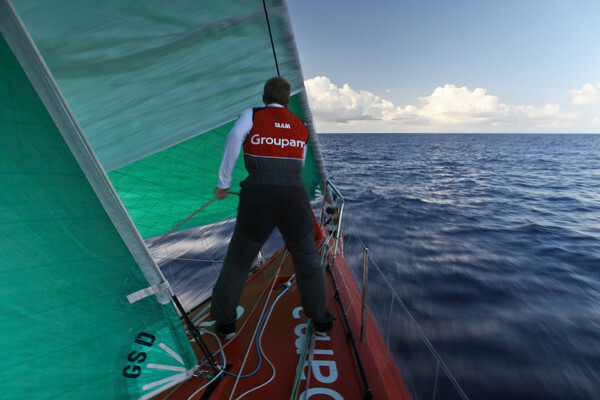 Meanwhile, Groupama and her skipper Franck Cammas, who trail the fleet by 113 nm, have picked up speed and were the fastest in the fleet in the past three hours. Throughout the night, CAMPER and Telefónica traded gybes. For several hours the pair raced side by side with Telefónica just off CAMPER’s port side, 150 nm off the coast of Brazil. 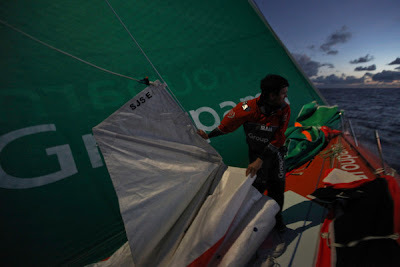 As the battle raged, each team tried sailing first in one mode, gauging performance, and changing to another, much as PUMA did to keep Telefónica at bay two days ago in an effort to gain the upper hand. 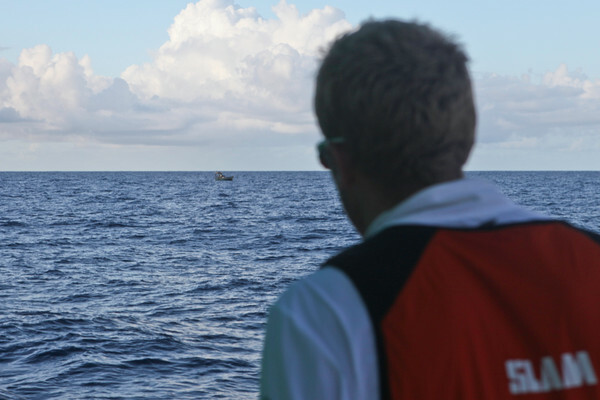 At 0700 GMT today, after gybing away, Telefónica emerged five miles ahead of the red boat. Telefónica skipper Iker Martínez said the remaining 2,700 nautical miles do not look as straightforward as he had imagined and he is expecting some important tactical decisions ahead and certain points where lots of miles might be dropped. 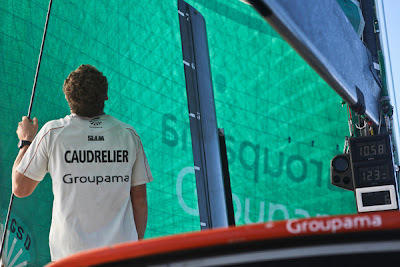 “We are keeping our guard up,” he said. 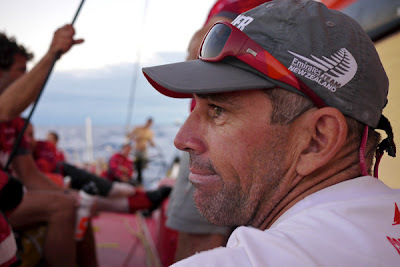 The fleet is due to cross the Equator within the next few hours and then has around 150 nm to sail before reaching the light-wind Doldrum-belt, which could still shake up the overall leader board considerably. As the crew of PUMA continue to revel in their lead position, with skipper Ken Read commenting, “sailing on a Volvo Open 70 doesn’t get any easier than this,” for fourth-placed Abu Dhabi Ocean Racing the struggle continues. 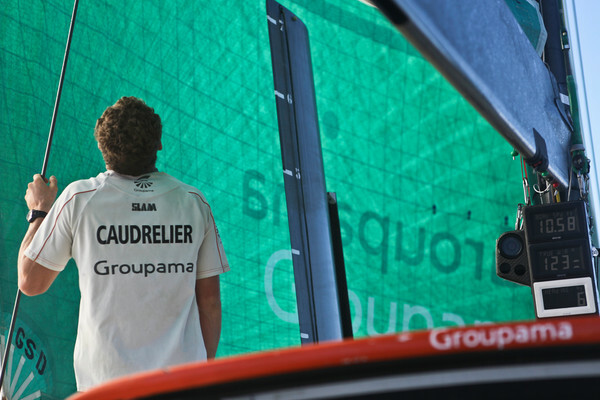 The team is in less wind than the boats ahead and less wind less wind than fifth-placed Groupama sailing team, who are pounding along and averaging 17.9 knots. 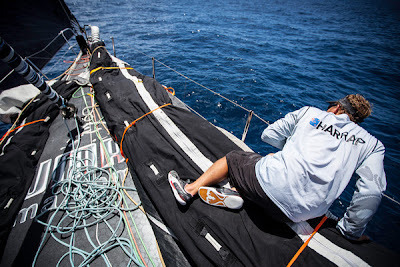 The wind has headed a few degrees forcing Ian Walker and his men to sail tighter angles, and the crew have changed to a code zero sail, which will allow them more versatility in the changing wind speed and angles without sacrificing as much boat speed. 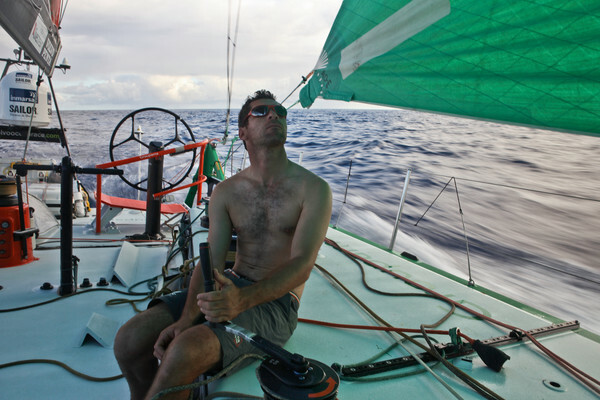 “Now, all we need is our luck to follow suit, and the breeze to fill in a few more knots,” wrote Media Crew Member Nick Dana.